See this? 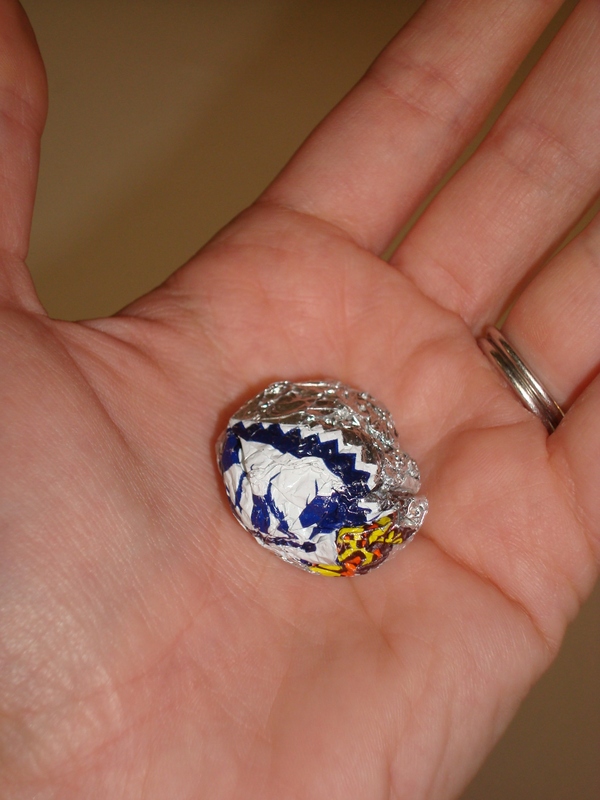 To you, it may be just a tightly wadded Klondike bar wrapper. But to the Stuart household, it’s been a lot of fun lately. They are delicious. But, really, the most fun thing about them is that the wrapper is great… ammunition. Tightly squished, the foil can be thrown at high speeds at unsuspecting housemates, and the accuracy is impeccable. What was a silly game of throwing one particular wrapper back and forth at each other has turned into a strategic, focused, and perfectly-timed exchange at just the right setting. Here’s how a recent sequence has played out: JD is in possession of the foil ball. He waits a couple of days, perhaps on an unsuspecting Tuesday evening while I’m watering the plants, and quietly, but accurately, he hurls it at me, right in the head. I hurriedly grab the paper weapon, and it stays in my possession. I wait a couple of days (this is important), and before work one morning, while he’s telling me goodbye from the door in the garage, I reach down in my car and throw the ball swiftly and quickly toward him. It’s a perfect shot… right in the, er, man parts. (Best one yet.) I can’t revel in the glory too long: I am now in “fear” for the next quiet day when he will get his revenge…. The cycle continues. Yes, this is a totally goofy game. It is quite silly. But, times like these make you realize that you’ve married your best friend and having fun is so important! Between scheduling dinners, dividing chores, fixing fences, working on our budget, and all the other boring things you have to do together, something like a competitive foil-ball-throwing exchange sure can get you laughing. I highly recommend it. Oh, and JD: watch your back.